Day 28 - are you counting down yet? Right - LCM (aka Bah Humbug the Misery Guts of Xmas Doom) has actually given in. Yes, you have read correctly. I have given in. I blame the kids, personally. And the freezing temperatures. I mean even the local swings and slides have become the 'slips and slides', and there is only so much outdoors cold you can impose on young children before even they start to complain about the insides of their noses freezing. But - what I am most proud of was my own ingenuity when faced with facts. 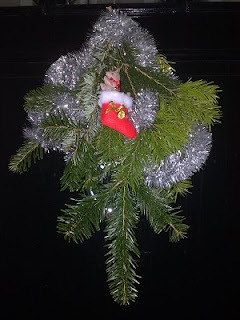 The facts being that a neglectful LCM had failed to remember that last year's fairy lights for the Xmas tree went to meet their maker once the decorations came down. What to do? Traipse out to the shops in the hope of finding a spare set? Blossom's godmother put me right as she passed by the house to drop off her present. "You will never find any," she stated quite emphatically. So much for even starting to hunt some down. 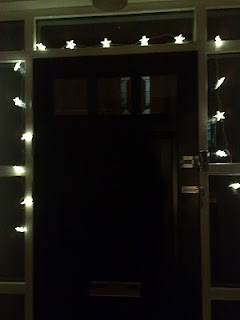 Should I resort to dismantling my oh-so-wonderful front door star light adornment (too short anyway and they had grown on me by now)? And then a stroke of genius (com'on, give me some credit here). How about the garden lights we used during the summer that clipped on to the umbrella? What can I say? Ta-da! 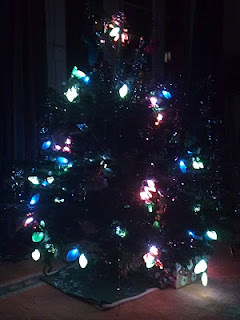 I give you the LCM indoor/outdoor Xmas tree special. At least there is now a touch of lightheartedness about the whole thing. Life is too important to be taken seriously (Oscar Wilde). Leave me a comment. I may consider the alternative (LCM). Here come the girls. I think. Random musings, and then some.